Over the next few days Opinio Juris will be conducting a virtual symposium to discuss Professor Harold Hongju Koh’s article The Trump Administration and International Law. The article was published in a special Symposium Issue of the Washburn Law Journal, which also includes articles by David Sloss, Peggy McGuiness, and Clare Frances Moran, responding to or picking up on the themes of Harold’s article. 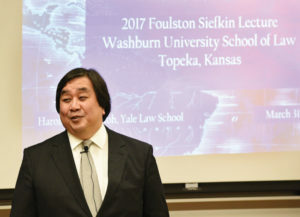 The article was in turn based on a wonderful lecture that Harold delivered to an entranced standing-room only crowd at Washburn University School of Law in March 2017. He is expanding the article into a book that is soon to be published by Oxford University Press. Harold’s article addresses the key question of whether the Trump administration will disrupt America’s relationship with international law and its institutions. It argues that transnational actors both inside and outside the U.S. government are operating to resist such change, and to frustrate or mitigate the Trump administration’s efforts to stretch or break international law. This, Harold argues, is yet another example of transnational legal process, the theory that is of course famously associated with Harold’s name. Transnational legal process theory provides the basis for a counter-strategy to resist the efforts of the Trump Administration. In broad terms, it suggests the choice of engagement over unilateralism, an emphasis on choosing persuasive legal translation over denying the applicability of international law at all, and the leveraging of “international law as smart power” rather than over-reliance on hard power. All of this, of course, stands in stark contrast to the Trump Administration’s approach to international issues. More specifically, colorfully invoking the metaphor of Mohammad Ali’s “Rope-a-Dope” strategy, Harold explains the process by which transnational actors have and continue to interact with, interpret, and internalize international law, and how this will operate externally to hold the Trump Administration accountable to American international law obligations, and internally to constrain and frustrate the ability of the government to effectively abrogate American commitments and undermine international law and its institutions. Having thus set out the theoretical account for how transnational legal process may operate, Harold examines a series of specific situations for purposes of illustrating how this process of interaction, interpretation, and internalization, has played out. These case studies run the gamut from the Trump Administration’s approach to immigration and refugees, through the Paris Climate Agreement, the Iran nuclear deal, North Korea, Russian Hacking, the Ukraine, Al Qaeda and ISIS, to the war in Syria. In each case, Harold explores how various actors both internal and external to the administration have responded in a manner that bears out and illustrates the legal process theory account, and how their actions have constrained and frustrated the efforts of the American government. While Harold’s analysis and overall argument are optimistic and encouraging, in closing he strikes a darker note in cautioning us on what is ultimately at stake. He warns that this is a struggle “between competing visions of a future world order.” His claim is not only that a counter-strategy informed by transnational legal process is currently operating to curb the Trump Administration’s efforts, but that it is essential to prevent “the slow backsliding of our Kantian postwar system into a more cynical, Orwellian system of global governance far less respectful of democracy, human rights, and the rule of international law.” In this sense, it is yet another contribution to the deepening sense that Western liberal democracy and the international law system are confronting existential threats, and provides a powerful argument for ways in which we can all meaningfully respond. For the symposium we have a group of distinguished scholars who have all done considerable work in different ways on the theoretical issues at play in this piece, and who will discuss various aspects of Harold’s argument. I expect that some will focus on one or more of Harold’s specific case studies, exploring in more detail his theoretical explanations for what is actually going on in each of them, while others may grapple with the application of transnational legal process theory more generally, and whether it is indeed as well suited to the task as Harold suggests. The line-up will be (though not necessarily in the order that they will appear): Bill Burke-White (Pennsylvania), Laura Dickinson (GW), Bill Dodge (UC Davis), Kevin Jon Heller (Amsterdam), Freddy Sourgens (Washburn), and Melissa Waters (Wash U). It is my hope that this will help to generate a robust discussion, both here in the comments section and elsewhere, and that the discussion in turn will help to inform the development of Harold’s upcoming and important book on this subject.